The Red Cross Discharge Employee Union (RCDEU) on Tuesday called off its indefinite hunger strike launched against alleged corruption in the Red Cross Hospital in Guwahati. Kamrup (Metro) Additional Deputy Commissioner Prasanta Pratim Kathkotia offered drinking water to the protestors to call off their indefinite hunger strike. It may be mentioned that the union launched the strike on Monday against various anomalies in the hospital. The protestors submitted a memorandum stating various demands to the ADC, Kathkotia. 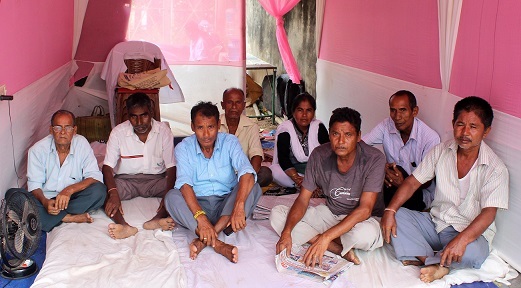 Phatik Das told reporters that the union would re-launch the indefinite hunger strike if their demands are not solved. Union president Ramen Barua during their protest on Monday alleged that the union would not let the ‘corrupt’ people to destroy the Red Cross hospital at Chandmari in the city which has a glorious past.